• Bring one or two of the central themes to the child. For example, for a book about a little girl and a pumpkin, bring a real pumpkin and a life like doll to the child. Support as they explore the objects with hands and eyes as the story is read. • Use an iPad. For children who are able to understand and process pictures, take pictures of the book’s contents before the story is read. Show the child the pictures using back lighting, zoom in to reduce visual complexity, and expand function to their benefit. • If the pictures from the book are too complex, showing these to a child who cannot process them is not helpful. If the story is about a cow, and the child has shown the ability to understand simple clear photographs, call up a simple picture of a cow and use that instead of the pictures from the book. * Peggy Palmer, M.A. Peg is a Teacher of the Visually Impaired (TVI) working at Bureau of Education and Services for the Blind (BESB) in Connecticut for over 20 years, specializing in young children, ages birth to five. Peg is a Perkins-Roman CVI endorsee. This is a fantastic and, dare I say, accessible way to describe how our children learn, and how they DON’T learn. Every parent, preschool teacher, and aide should read this post. Thank you, Peg. Thank you, Start Seeing CVI. Thank you for this information. Do you have references based on the idea of “empty language”? I would like to look into it further. My daughter has CVI when she was younger and I read to her I always had 2 books that way she had her own and could study the picture. I waited til she was done “reading” to “turn the page” Today (she’s 9) she reads electronically with headphones. her regular reading speed is slow but with audio and sight she can keep up. Her reading comprehension is awesome. 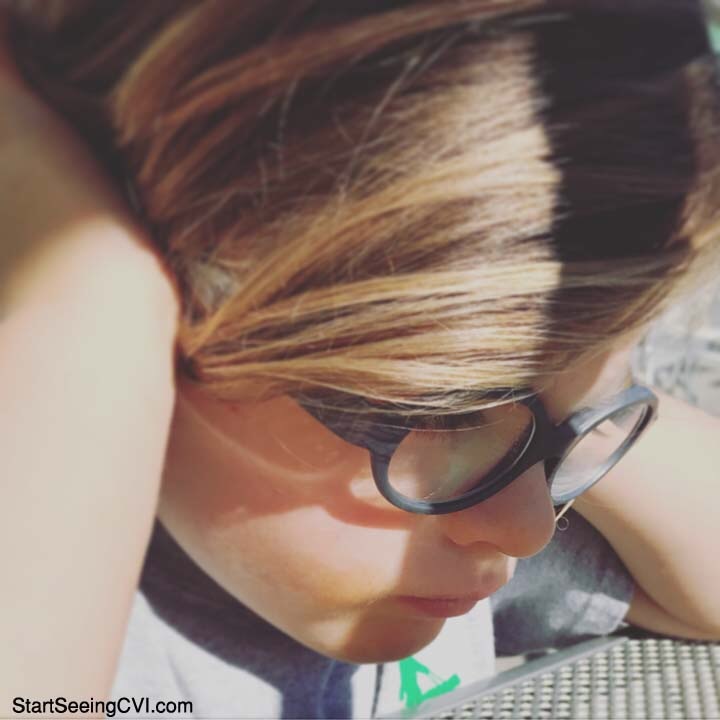 I am a parent of a child with CVI, I have been flying blind for years – no support just a diagnosis – I have been battling the schools etc alone. I have recently learned I did many things right. On reading with my child and to help with reading comprehension I used a home made felt board (old game board) I planned ahead and only gave her felt pieces that matched the story – as the story progressed she created the picture. ex: story about a garden – flowers, bees, watering can, hose, rake, she would create ……… bee visited the flower, hose used to fill watering can, bee visits flower etc. my goal was to help her visualize what she was hearing. As she got older – on her own – she started “writing” stories using her felt board and taking pictures with an old phone – she loved reading her stories back to me. Today (she is 9) she has a Kindle and reads her audio books while reading the words. She also writes stories using her computer. Unfortunately, her school has not supported any of this. She is entering a new school in the Fall – Innovation Academy Charter School in Tyngsborough, MA . Any suggestions on how to get them to work with me? I have given them linc to CVI teacher etc. my PTSD on this subject is giving me anxiety. I currently have her IEP to sign, how do I include the stuff I know she needs – she is not cognitively delayed she has CVI. HELP!!!! Feel free to email with other questions, StartSeeingCVI@gmail.com.